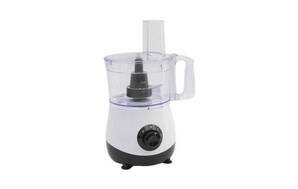 Snapshot: The Home & Co FP9053KB-GS 42-444-428 food processor has 2 speeds, but no storage for attachments. How does it rate? Excellent at kneading pastry and emulsifying mayonnaise. Very good at grating cheese. Comes with a chipping blade. Reasonably stable on bench during processing. Sealed bowl shaft so less likely to spill and easier to clean. Some blades are accessible by hand through the chute. Performance (60%): Based on how well the food processors performed across a range of processing tasks: slicing carrots, chopping breadcrumbs, grating cheese, kneading pastry and emulsifying mayonnaise. If a processor has a blender attachment, we puree soup. If it has a mini-processor we make pesto and curry paste. These additional tests don’t contribute to our overall score. Ease of use (40%): We also looked at how easy it was to use the controls, read the labels, lock and release the bowls and attachments, and clean and store the unit.